I saw “Haywire” exactly a year ago today, and I’m sorry to say that I was rather disappointed. Despite hearing reports of weak fight scenes and uninspired acting, I still had my hopes. You see, I’ve been waiting for a film like this for a while – an action film with a female cast in the starring role who can both act and do all her own action… essentially a stunt actress. It’s exactly the thing I think the action genre needs, and what I’m trying to become myself, so I was eager to see a movie that was taking a step in that direction. We’ve learned through the many eras of male action leads that the only truly successful “stunt actors” are those who start out as fighters and then learn to act. It’s much harder to have an actor learn how to do all those complex and dangerous stunts themselves, which is why most all actors have stunt doubles. Even today, as more actors like Tom Cruise, Jason Statham and Matt Damon are starting to do some of their own fighting and stunts, they still leave the really complicated stuff to the trained professionals. But a stunt person who can also act? Now that would really be something. And it’s in very high demand, despite being extremely rare. Directors and fight choreographers alike love it because they don’t have to restrict the camera movement for fight scenes in order to hide a stunt double. Producers love it because it saves money – not needing to hire a separate stunt man. And audiences love it because it’s cool to know that the guy on screen did all his own stunts. That’s why Jackie Chan became such a household name – that and because he was GOOD. But we’ve yet to see a strong example of this from a female. And now as martial arts become more universally acceptable and popular, and the market for female fighters on screen grows, I think it’s about time we had one. 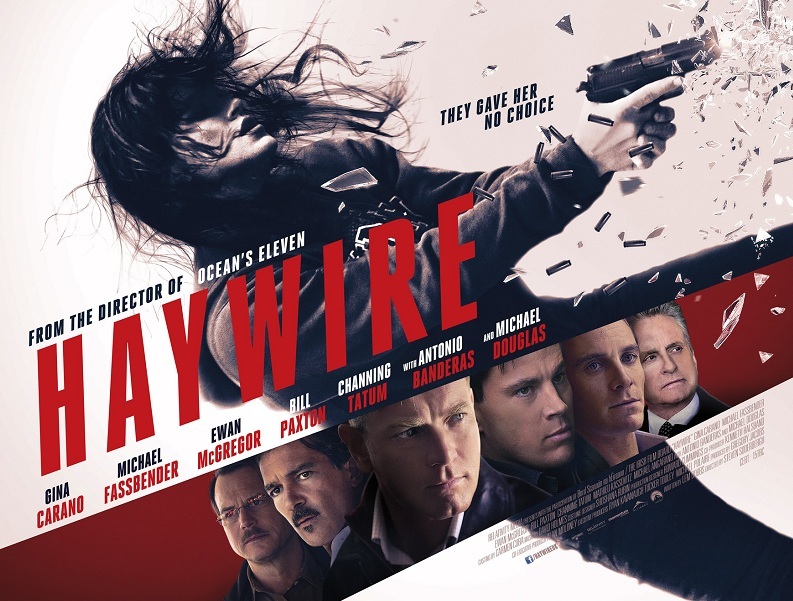 This is why I had hopes for “Haywire,” and particularly for Gina Carano. She has the right background – a long time MMA competitor who can really fight and just needed to add the acting component. But alas, “Haywire” was not going to give her that opportunity. Granted it wasn’t all her fault. The story lacked originality, the writing lacked emotion, and the characters lacked depth. And not just for her character, but for the ridiculously name-packed male supporting cast they surrounded her with. I was underwhelmed with all of their performances (save for maybe Michael Fassbender) and each was given too little screen time to show any kind of character development worthy of audience esteem. So Gina Carano didn’t have much to work with anyway. But then you could also tell just how uneasy she was on camera, and how little acting coaching and support they’d bothered to give her. This just made her seem all the more stiff and one-dimensional, and as a result, very hard to relate to or care much about. So another hope dashed. I guess I will just have to wait for another chance to see a good female stunt actress take the lead. Or I’ll just have to do it myself!